Sorry I’ve not updated my blog much lately, but I’ve had a little project on my plate. I was asked to man the Big Shot in Product Playground and a part of that was to also make a sample display. 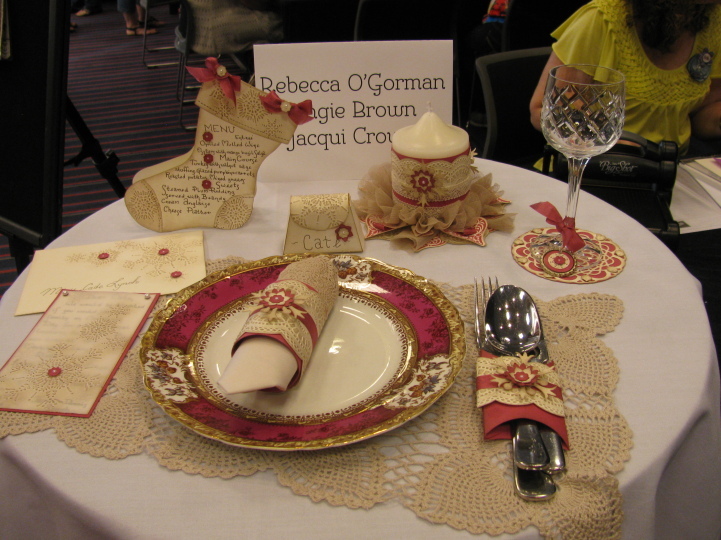 I was blessed to be working on the table with Rebecca O’Gorman and Angie Brown (who are both amazing crafters and lovely ladies as well!). We co ordinated our displays and came up with diverse samples for everyone to view. I decided I’d like to try and make a formal Christmas Dinning Setting with a tinge of a vintage feel about it. We had a fabulous day. There’s no doubt about SU they certainly know how to put on a ‘do’. Fabulous presentations and displays and yummy lunch. Whilst not all displays and talks were Christmas based, the day definately had an underlying Christmassy theme. I was blessed to have along with me as my guest, my future daughter-in-law, Anna. My son, Joe, describes her as “Little Miss Christmas” I’m sure she was in Christmas heaven for the day. I’ve got lots more pics so come back and visit me again so that I can show you lots that went on. Snow Flurry Bigz Die,Holiday Stocking Bigz Die, Petite Purse Bigz Die, Northern Flurry embossing folder, Delicate Designs embossing folder, Paper Doily Sizzlet, Boho Blossom Punch, Itty, Bitty Shapes Punch Pack, Crumb Cake Tulle Ribbon (delicious, soft and delicate stuff! ), millions and millions of pearls of all sizes. No rest for me now though, I’ve my usual Tenterfield class on Thursday and then I need to prepare for my Lismore girls stamp-a-stack next week. Stay happy and stay stampin!